At the outset of Russia’s bid to host the Winter Olympics in Sochi, a goal was set. Russia claimed that if it could host the Olympic Winter Games, it would be the cleanest Olympics ever, with minimal environmental impact. It would be a ‘Zero Waste’ Olympics, with no extra waste, green-friendly buildings and construction practices, state-of-the-art accommodations and more. The Olympics of the future, setting new standards not only for what an Olympic venue can be, but how to make it happen responsibly in a time when it is vitally important that all nations are increasingly mindful of their environmental impact. It would be a challenge, but it would be worth it. Russia would get the chance to prove its mettle as a real world power of the 21st century and environmentalists along with the IOC could rest assured that the Games wouldn’t leave behind lasting scars on the natural beauty of the Caucasus. This would be especially important since the Western Caucasus region is highlighted as a key biodiversity hotspot, with 51 species in need of protection. Except that is not how it went. At all. Looking back now, the ‘Zero Waste’ promise appears to have been little more than a lie. It all sounded very nice on paper, but if Russia wasn’t going to stick to the plans in practice, the promises would be meaningless. And, boy, did Russia not stick to the plan. As soon as construction projects started, local sources of water began to dry up, and allegedly a good portion of the local water was diverted for concrete production. Once construction was underway, it became increasingly obvious that it was not a ‘zero waste’ endeavor, mainly from the tons and tons of toxic waste being illegally dumped in the countryside around Sochi. After all, the best way to have zero waste is to keep it off the books. Just don’t legally process any of the waste and it’ll be as if it never existed, right? Except the waste has to end up somewhere. 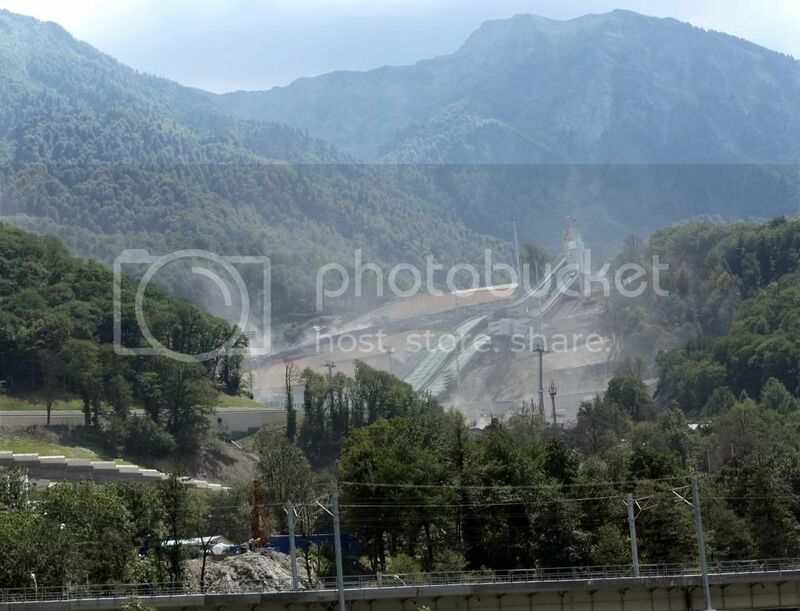 The Akhshtyr dumping site highlighted in Nataliya Vasilyeva’s article is just one example of the kinds of illegal waste sites that have sprung up over the last seven years in the area around Sochi, but this site is only the tip of the iceberg. It turns out there are more than 50 such illegal sites in the region, where the Russian companies involved in making the Sochi Olympic Village a reality have been dumping their industrial and chemical waste for years. Apparently, living nearby these dumps has become unbearable, with the Pan-Russian Nature Conservation Society stating that life within a two kilometer radius of any of these dump sites is now “impossible,” what with the contaminated water and degenerate landscape. Locals can’t even enjoy a swim in what were once lovely temperate rivers, as they now run thick with toxic, bubbling slurry. Russia can’t just make the promise of a ‘Zero Waste’ Olympics, subvert that goal at every opportunity and expect to get away with it. Surely someone must be watching, keeping tabs on the situation? Indeed there is. This is where Suren Gazaryan and the Environmental Watch on the North Caucasus (EWNC) come in. They have been diligently watching the environmental situation in Sochi and assembling reports to show all of the Russian government’s broken promises. Or at least they have been trying to. Gazaryan is currently keeping an eye on the situation from Estonia. Where he is in exile. Because in response to his reporting on the environmental situation in Sochi, the Russian government has accused him of murder. And he isn’t alone. His fellow EWNC environmentalists have been tailed by the police, verbally abused, beaten up, falsely apprehended for driving drunk, jailed and generally harassed and obstructed by law enforcement in any and every way that might obstruct them from continuing to keep tabs on the environmental destruction around the Sochi Olympics. With police obstructionism heightening as the Games approached, the EWNC has struggled to get its full reports out to the press by the time the Olympic media spotlight arrived, missing a key window of opportunity to capture some of the international attention that right now is so focused on Sochi. Despite some IOC members expressing regret over the selection of Sochi as a host city, Gazaryan is skeptical that much attention will be paid to Russia’s broken promises and the environmental catastrophe that has transpired there. The threat of terrorism will most likely diminish once the Olympics are over. The hotel problems won’t matter much once the media has left town. Visitors to Sochi only have to worry about hackers during their visits to Sochi. The legacy of the 2014 Winter Olympics will undoubtedly include many spectacular moments of triumph and achievement, as is always the case with the Olympics. But the true and lasting legacy of the 2014 Winter Olympics, at least for the people of the Caucasus, will be the blight on the environment brought about by the negligence and broken promises of the Russian government. Russia wants the Sochi Olympics to prove that it is the model of a 21st century nation. The chances of that happening are most likely zero.